On the evening of October 7th and through the early morning of October 8th, 2016, Hurricane Matthew struck the coast of South Carolina including Beaufort County. As a result, the County experienced severe high winds, flooding and storm surge. The end damage was extensive including construction and demolition debris, downed trees, broken, damaged or sunk docks and vessels. All of this caused environmental and navigable challenges to the citizens who used these waters. The County immediately started the process of determining whose legal responsibility it was to remove these hazards from waterways. This process took 180 days. On January 31, 2017, a letter from the State Attorney General, Alan Wilson, stated that the County would have ultimate responsibility to maintain the marshlands between, within, the Mean High Tide line and Mean Low Tide Line. It was determined from various reports and visual inspections that the area in need of recovery encompassed approximately 107,000 acres of waterway. In total 33 vessels and approximately 16,702 cubic yards of debris were removed from the waterways incurring $6,696,774.88 in removal and $654,468.00 in monitoring costs. Marine debris is defined by National Oceanic and Atmospheric Administration (NOAA) as “any persistent solid material that is manufactured or processed and directly or indirectly, intentionally or unintentionally, disposed of or abandoned into the marine environment or the Great Lakes.” Beaufort County has taken lessons learned from Hurricane Matthew to develop a specific plan for marine debris to improve disaster response and recovery following a waterway debris incident that may impact Beaufort County’s coastline. In the first few days after the event, SC-DNR and the US Coast Guard will do a hazard removal in the navigable channels. If legal responsibility for all debris in waterways is determined to be Beaufort County’s, the County will first have to request approval from FEMA to begin work. Once this is done, DNR will start the process of identifying and inventorying vessels and debris. The contractor for Beaufort County will mobilize to start debris removal. The debris removal process will include an assessment phase and cleanup phase. During the assessment, the contractor will do a visual assessment of the acres to be cleaned up. The assessment will include mapped areas of debris and vessels. Once the initial survey and assessment is complete, and a total number of vessels are gathered, DNR will start their 45 day abandonment process for vessel removal. If during those 45 days, no one claims the identified boats, then those boats will be marked for removal. If additional boats are found after the initial survey, that could affect the completion timeline for debris removal. During the clean-up phase, the County’s contractor will start removing debris from the waterways, including vessels once they reach the end of the 45 day abandonment process. The amount of debris to be removal will be the amount surveyed during the assessment phase. If needed, the County will apply for 180 day time extension to FEMA to complete removal. 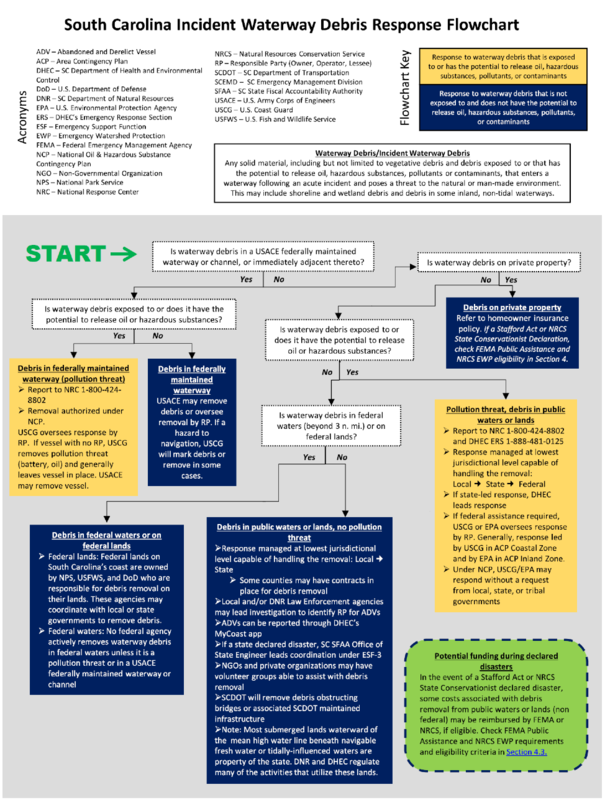 The NOAA flowchart below provides a visual representation of agencies roles and responsibilities to a waterway incident.